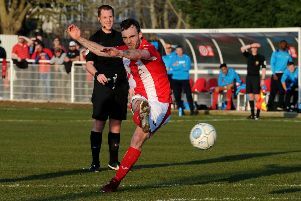 Brackley Town manager Kevin Wilkin is hoping his side can pull out a Football League club in tonight’s (Monday) Emirates FA Cup first round draw. Saints beat Bamber Bridge 3-0 in Saturday’s fourth qualifying round tie thanks to a brace form Steve Diggin and a goal for Richard Batchelor at St James Park. Wilkin had to make changes for the tie with keeper Dan Crane departing for Hednesford Town while on-loan duo Aidan Hawtin and James Akintunde were not given permission to play by their parent clubs. Sam Horby made his debut betwen the posts and Wilkin added: “I was delighted with the performance, particularly with the changes we had to make from the Gainsborough game.